This year I was commissioned to write a new work to celebrate the 500th anniversary of the reformation. The commission came from Cherry Creek Presbyterian Church and Evan Mazunik. The work was performed on reformation Sunday at CCPC and the recording is here. 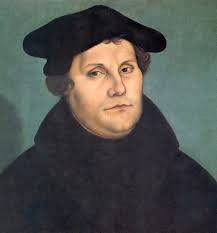 To The Sons of Korah celebrates the 500th anniversary of the reformation. It is based on the reformation hymn “A Mighty Fortress is Our God” which itself is based on psalm 46. The piece moves gradually through various dissonant collections towards a final, celebratory statement of the hymn itself. The two trumpets are also asked to play in separate parts of the performance space, only physically joining together in the middle of the piece. Both of these effects symbolize the unification and emergence of the church from a period of separation, corruption, and debauchery. The title pays homage to the authors of psalm 46, the Korahites, who were an important branch of singers from the Korahite division of Levites. I think it would be interesting for these ancient musicians to see the many different permutations their work has taken over the centuries, not least of all this one. Unfortunately the recording itself wasn’t amazing because this was performed as part of a service, rather than a concert, but it’s still worth listening to.